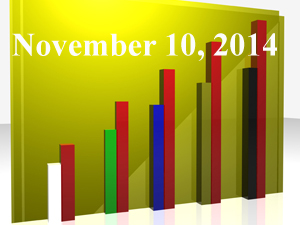 “Retirement Saving: How Responsible is the 401k Fiduciary?” (FiduciaryNews.com, November 4, 2014). Welcome to the new three-legged stool: Employee, Employer, Government. “6 Questions for Sen. Hatch on Retirement and the Election,” (ThinkAdvisor, November 5, 2014) Pay close attention to the last question. After getting past all the evidence that the insurance lobby is quite potent in the first few questions, the final one has the earmarks of a watershed change in the way the 401k is delivered to employees. “Why do some hate the 401k?” (BenefitsPro, November 6, 2014) A sneak peek at what to expect from a Republican-controlled Senate? “Republicans expected to tackle retirement issues in 2015,” (InvestmentNews, November 6, 2014) There’s a lot of bipartisan support for “reform,” thanks mostly to the dollars flowing from the insurance lobby. Ironically, the most innocuous of items – one not supported or opposed by the industry – may be the one thing that frees abused retirement savers from the stranglehold of the “too-big-to-fail” club. “IRS Simplifies Filing for Americans in Canadian Retirement Plans,” (ThinkAdvisor, November 6, 2014) There are 1 million Americans living and working in Canada that this applies to. It becomes clear this was never really a serious initiative, just a bone used for political purposes. Too bad. “New DOL Fiduciary Rule Before Obama Leaves Office? Maybe Not,” (ThinkAdvisor, November 4, 2014) Here’s red meat for the foes of fiduciary compliance courtesy of the annual SPARK Institute meeting. It outlines a strategy for using the newly minted Republican majorities to stymie Phyllis Borzi’s efforts. It could, and probably will, work. On to Plan B for the advocates. “Plan Fiduciaries Liable for Mispriced ESOP Stock Purchase,” (PLANSPONSOR, November 5, 2014) How many times have we seen this happen? Does this mean the DOL is also looking at conflict-of-interest fees? “DOL Intensifying Scrutiny Of Advisor Retirement Plan Fees,” (Financial Advisor, November 4, 2014) Not a lot of meat in this article, despite its length. No real hint at benchmarks, guidelines, or smoking guns. Risk doesn’t matter, only returns can put food on the table. Likewise, annuities usually can’t put food on the table, either (unless you’re rich enough not to need them). Saving for tomorrow will always put folks ahead of those who don’t save. ‘nuf said. “How 401k Plans Have Fueled Inequality in America,” (Businessweek, November 3, 2014) A headline like this usually entails a story about those bad, bad people who dare save too much in their retirement plan; thus, selfishly reaping the rewards for delayed gratification while simultaneously those who “lived for today” instead of “saved for tomorrow” wallow in their supposed poverty. That would have placed this article in the “Compliance” category above. Instead, this article entertains us with the story of those bad, bad people who dare not sell when the market bottomed in 2009; thus. Selfishly reaping the rewards of emotional discipline while simultaneously those poor souls who gave in to irrational emotion suffer the consequences of “safe” investing. You read it here first folks. “Now that annuities are OK in retirement plans, what strategy is best?” (InvestmentNews, November 4, 2014) As you might expect, annuities now become part of one’s asset allocation. There’s only one problem – they’re generally illiquid. And you need a lot of money for them to make sense. “Will Retirees Come To Love Longevity Annuities?” (Forbes, November 4, 2014) It looks like this is a solution that satisfies the insurance salesmen more than consumers. Could Longevity Annuities be the next target date funds? “A step closer to fixing a serious 401k flaw,” (CBS News, November 5, 2014) So, here’s the deal. If there was a “serious” flaw in 401k plans not offering annuities, then why haven’t a lot of people bought them once they retired and their money could have been easily taken out of their 401k? See the Forbes article above. “Investors find better balance in their 401ks,” (CNBC, November 6, 2014) This has been a popular meme across the mass media. It really began with the market drop in 2009 and re-intensified with the market swoon in October. There’s only one problem with it – it’s totally wrong. It forgets the main problem with the 401k plan in going into the 2000s was that savers were too conservative. That’s what the Pension Protection Act of 2006 was supposed to address (and it did to some extent). Here’s the reason for the problem: People should focus less on risk and more on return. The best way to get long-term returns is through investing in stocks. “Primal Fear: Thinking Differently About Risk Tolerance,” (Financial Planning, November 6, 2014) If you want to know what’s wrong with the way the industry looks at risk, read this article. Not because it will tell you, but because, in condemning the industry’s view of risk, it advocates that very same view – albeit with more nuanced psychological jargon. It enables investors to allow their fears to overtake their needs. It ignores the need for investor discipline and the primacy of the role of the advisor to coach the investor to stick to that discipline.